Environment Southland’s Catchment team manages 10% of the drainage schemes in Southland and it is usually the lower outfalls of community drainage networks. The Waituna Liaison Committee was formed in 2011 following communication between members of the Waituna community and Environment Southland, which identified the need for local input into Council’s management of the Waituna Creek Drainage District, which consists of Waituna Creek and its tributaries.The Waituna Creek Drainage District was last reclassified in 1976 and is calculated on average land area benefit assessment, not capital value. The drainage district is assessed every three years for work. 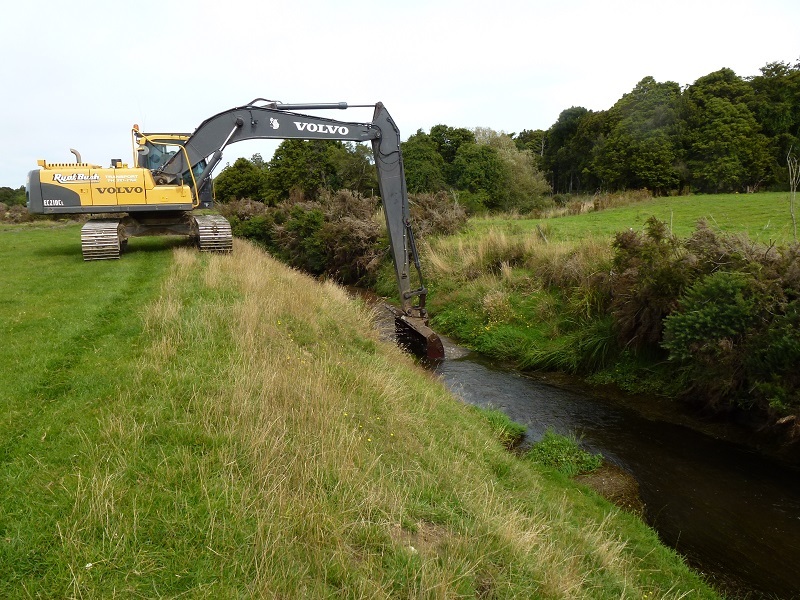 On the Waituna Creek, from two kilometres downstream of SH 92 to the start of the drainage district at the southern end of Marshall Road, cleaning is carried out on a five to 10 year cycle as required. Work on the tributaries and the remainder of the main stem is usually required on a three-year cycle depending on summer growth. There is currently a spray trial underway, to see if this minimises the frequency of cleaning required, and therefore disturbance to aquatic life. Drain clearing in 2012.Photo by Environment Southland.